The shape of this Barn Owl’s face is adapted by nature for perfect hearing. 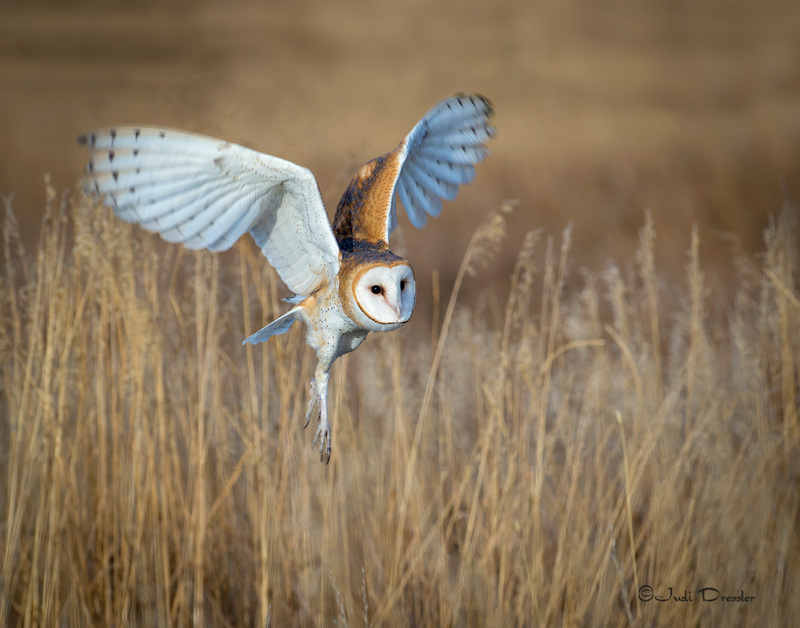 Did you know that Barn Owls can hunt even on the darkest nights, using only their super sensitive hearing? This shot was taken during a raptor workshop in the fall of 2016, in Aurora, Colorado. To see a larger image of the above photo, click directly on the photo. Note that the actual large print, should you choose to purchase it, has a tiny signature. The big signature/watermark on the image above is for copyright protection to prevent unauthorized use. Judi Dressler is an award-winning wildlife photographer whose fine art photography is a collection of bird and other wildlife photos. Judi's photographs include images of birds such as herons, egrets, raptors such as hawks, eagles, kestrels, falcons, owls, songbirds, shorebirds, waders, waterfowl, ducks, quail, grouse, and more. Also Judi has some photos of 4-legged creatures including marmots, pikas, and hooved animals such as deer and elk, as well as wild Mustang horses, and some landscapes, which usually contain wildlife but not always. She has won numerous photography contests, including being awarded the Gold Medal by the Peregrine Fund, Droll Yankees People's Choice winner, winner in a Fine Art America contest, one of "Ten Best Photographers" at Denver Audubon's Share the View International Nature Photography Contest, top 100 in The Nature Conservancy photography contest, and has been chosen in the final round in many photography shows. Judi is based in Louisville, Colorado. She's out taking photos as often as time permits, mainly near her home. Specific birds include burrowing owl, barn owl, great horned owl, screech owl, elf owl, barred owl, owl, red-tailed hawk, red-tail, hawk, harris hawk, northern harrier, swainson's hawk, red-shouldered hawk, kestrel, bald eagle, golden eagle, eagle, falcon, prairie falcon, aplomado falcon, gyrfalcon, turkey vulture, vulture, heron, great blue heron, egret, snowy egret, great egret, reddish egret, crane, sandhill crane, black-crowned night-heron, cormorant, spoonbill, hummingbird, broad-tailed hummingbird, broad-billed hummingbird, costa's hummingbird, parakeet, budgerigar, budgie, white-breasted nuthatch, nuthatch, flicker, northern flicker, yellow-headed blackbird, magpie, robin, cardinal, northern cardinal, wren, house wren, downy woodpecker, woodpecker, red-bellied woodpecker, red-belly, hoffman’s woodpecker, blackbird, red-winged blackbird, white-winged dove, dove, black-capped chickadee, jay, steller's jay, goldfinch, cedar waxwing, finch, pintail, northern pintail, shoveler, northern shoveler, duck, hooded merganser, merganser, gadwall, snow goose, snow geese, canada geese, goose, canada goose, wood duck, gosling, american wigeon, avocet, american avocet, tern, pelican, brown pelican, american white pelican, white pelican, gull, seagull, ring-billed gull, prairie chicken, chicken, gambel's quail, quail, grouse, greater sage-grouse, sage-grouse. Specific mammales include: bat, pallid bat, mountain goat, pika, american pika, marmot, yellow-bellied marmot, deer, mule deer, antelope, elk, monkey. capuchin monkey, white-faced monkey, orangutan, gorilla, dog, puppy. Also there is a gallery of wild Mustangs, which are wild feral Horses originally brought by Spaniards in the 1400 and 1500s. Scenic landscape photos include sandhill cranes flying into the sunset, photos taken from over 14,000' at the top of Mt. Evans, Waimea Canyon in Kauai, the harvest moon over the foothills, and Canada Geese taking off from a pond. Photographs were taken in Colorado, including Boulder, Louisville, Longmont, Denver, Erie, Lafayette, Superior, Greeley, Fort Collins, Littleton. Lakewood, Broomfield, Arvada, Westminster, the Pawnee Grasslands, Barr lake State Park, Walden, and Summit County. New Mexico photos were taken at Bosque del Apache National Wildlife Refuge, and at the Albuquerque Zoo. Nebraska photos of the Sandhill migration were taken near Kearney. Maine photos were taken on the east coast near Portland. Costa Rica photos were mainly taken at the southern tip of the Nicoya Peninsula. Photos were also taken in Arizona near Green Valley, and some were taken on the California Coast. "I feel so lucky to be living in this wondrous world, where we are treated to the most amazing wild species! Our mysterious universe revels in diversity, in the splendor of variety and beauty. From swift multi-colored ducks, elegant social herons and agile independent raptors, to mountain goats and pikas, these amazing animals do their utmost to survive and to procreate, usually under very challenging circumstances. My goal is to capture some of the marvel and personality of wildlife, and to inspire those who see my photographs to deepen their appreciation of it and to protect wildlife in a world where species are disappearing at an alarming rate, due to habitat loss, climate change, and a host of other man-made challenges." All photographs are available in a variety of sizes, should you be interested in purchasing. Judi always enjoys talking with viewers about birds and wildlife. Please contact her if you have questions or comments or if interested in a purchase.